Portadown manager Matthew Tipton is aiming to transfer extra time on the training pitch into increased points. A break in the Bluefin Sport Championship programme last weekend due to Declan Dunne’s selection for Northern Ireland under 21s handed Tipton an extra opportunity to use behind-the-scenes work towards forward momentum. With promotion back up to the senior stage the ultimate objective, Tipton sends his side into a weekend date at home to Dundela aware three points would send the Ports into joint second. Dundela currently hold second behind league leaders Larne but Portadown have played one fixture fewer, adding as a result to the excitement ahead of the welcome return to competitive play. “The break from games offered us a chance just to get together on the training ground and reinforce the ideas of the coaching team,” said Tipton. “The lads are keen to get back to playing of course but we want to see a return to the coaching ethos we have been working hard to get in place. “Getting that balance right between defence and attack will ultimately lead to the desired mix of everyone working together to create room for individual expression. “It is about making the right decisions at the right time and that comes by understanding the overall picture of what to do in certain situations and the jobs of your team-mates. 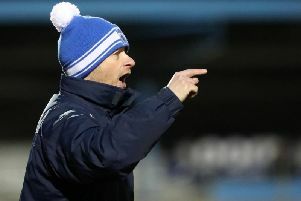 Promoted Dundela have been the surprise package of the second-tier standings to date but Tipton admits long-term admiration of the weekend visitors.